We also offer private pay options. When the black night of addiction has blotted out any ray of light, know this: There is a way back into the sun, with the guidance of those who have traversed those desolate landscapes. At Cornerstone of Recovery, we know the misery that is your constant companion. Since 1989, we’ve provided that guidance as one of the premier addiction treatment centers in the nation; many of our staff members are in recovery themselves and once lived as all suffering addicts do: helpless, hopeless and lost. Through recovery, they’ve found a new way to live, and together with trained clinical staff members from all disciplines, they’re carrying the message to those who still suffer. Does Cornerstone Accept My Health Insurance? At Cornerstone, we understand all too well that addiction and a bank account that’s in the black are often mutually exclusive scenarios. If you’ve made the decision to seek addiction treatment, you may be at a loss over how to afford it. The good news is that Cornerstone of Recovery is an in-network provider with most major commercial health insurance plans, meaning that your health insurance policy will likely cover some, if not all, of your drug rehab stay. More importantly, the employees in our business office have decades of experience working with insurance companies to get the most out of your behavioral health benefits, so that you can begin your recovery without the looming cloud of financial strain hanging over your head. If you currently have TennCare or are looking for lower-cost treatment that you plan to privately pay for, we would refer you to Stepping Stone to Recovery, our sister TennCare alcohol and drug rehab also located in Knoxville. Cornerstone, located in the foothills of the Great Smoky Mountains of East Tennessee, provides a place where substance abuse and mental health issues can be addressed head on, so that healing may begin. Our programs are based on the Bio-Psycho-Social-Spiritual model of treatment and the 12 Step approach to recovery, and we pride ourselves on the individualized treatment plans we develop for each and every patient, the goals of which are to dispel the darkness of their disease and allow that individual to function as a responsible, productive member of society. We provide medical detox services that allow our patients to safely withdraw from drugs and alcohol, and the therapeutic elements of our program include Cognitive Behavioral Therapy (CBT), Cognitive Processing Therapy (CPT), Dialectical Behavior Therapy (DBT), Acceptance and Integration Training (AAIT), Schema Therapy, Family Therapy, Individual and Group Therapy, Activity Therapy, Fitness, Chronic Pain Management and Psychoeducational groups and lectures. Each patient will be involved in individual and group therapy with a master’s level therapist, in addition to other processing groups that offer counselor and peer support. If you’ve found yourself here, know this: You don’t have to suffer any longer. There is a way out, and we can help you leave that darkness behind forever. With comprehensive treatment, your addiction can come to an end, and a new day is just over the horizon. Please, reach out to us, let us evaluate your situation and permit us to help you recover. 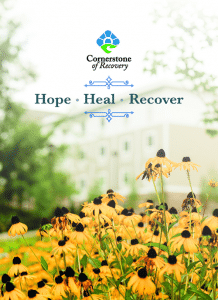 Cornerstone has developed alcohol and drug rehab & recovery programs to fit the needs of our patients. As with many things in life, there is not a one size fits all approach to treating the addiction disease. Through a proper assessment and evaluation period, Cornerstone of Recovery can make the best recommendation for each individual that will give them the best opportunity to achieve a lasting recovery. Clinically, the New Comers Residential Alcohol & Drug Rehab Program is one that typically lasts between 28 and 35 days, during which time our trained counselors and other professionals develop individual treatment plans for each patient according to needs, backgrounds and situations. During that process, patients participate in a 12-Step recovery. Our Young Adult Residential rehab and recovery program is specifically structured for persons between the ages of 18 and 26. Understanding that this age group faces its own unique set of circumstances, our clinical staff focuses on developmental issues, behavior styles, and energy levels specific to the young adult. Our Aviation Professionals program was designed for patients suffering from alcoholism, drug addiction and other substance abuse problems that work within the Aviation Industry. We are the first choice for many companies within the industry when the need arises to send one of their employees out for treatment. Addiction crosses all cultural boundaries and discriminates against no one, even the working professional. Whether you are a CEO, attorney, doctor , pharmacist, or possibly another State or Federally licensed professional our Professionals Rehab and Recovery program was designed for you. Our railroad workers rehab and recovery program is designed for patients suffering from alcoholism and drug or prescription medication addiction within the Railroad idustry. Our high success rate has led to Cornerstone becoming one of the most recommended treatment facilities within the industry. Our Intensive Outpatient rehab and recovery program is for addicts who have recognized their problem before it spirals completely out of control. These patients may need help but have yet to reach a point where 24-hour residential treatment is required. Timing is critical to these type of patients and immediate treatment is often the only thing that can keep things from getting far worse. Before the recovery process can begin, the hazy fog of drugs and alcohol must be lifted. To do that, patients often need to go through a detoxification process to cleanse their systems of alcohol and/or drugs. Our Continuous Care program was developed with one thing in mind- lasting recovery. Scientific studies of the disease process have determined that full remission from active addiction does not occur until an individual has experienced at least 18 months of continuous sobriety. This program provides 18 months of access to Recovery Coaches and is included with all of our residential treatment programns.